Het Plattelands Hotel Los Pastores in Ronda. Gebouwd op 200 duizend vierkante meter grond op het prachtige platteland van Andaluzië, is Hotel Los Pastores prima gelegen op slechts 3 km van de oude vestingstad Ronda. Het hotel is een klein familiebedrijf dat uitsluitend comfort en kwaliteit biedt, in een prachtige omgeving van het binnenland van Andaluzië. Elke kamer of appartement is compleet gerenoveerd en beschikt over airco voor in de zomer en een gezellige haard voor in de winter. Het Hotel is warm en gezellig en er komen mensen op af uit de hele wereld. Los Pastores dates back to 1938 and started life as a family farm keeping all types of livestock such as sheep, pigs, goats and chickens. After very extensive renovation works, Los Pastores has opened as a very welcoming and pleasantly rustic hotel set amongst some of the most beautiful Andalucia countryside around. Both the old stables and the haylofts have been converted into luxurious and generous sized guestrooms (all en-suite with king-size beds) While most of the livestock has left the estate along with its previous owner, abundant native wildlife life can still be found. The hotel is pleased to be able to offer many facilities you may not expect to find at smaller hotels. Het personeel is erg vriendelijk en heet u van harte welkom. Spaans is de gangbare taal in het Hotel, maar er wordt ook engels gesproken en andere europese talen. Klik op de foto´s en bekijk de gezellige kamers en appartementen van het Hotel. Arriving by aeroplane from Malaga airport, take the turnpike road in the direction of Marbella (you will be on the E-15 to Cadiz). Passing Marbella, take theturn right to Ronda. This road, the A-376, will lead you through the mountains for 47 kilometres, and will lead to Ronda. 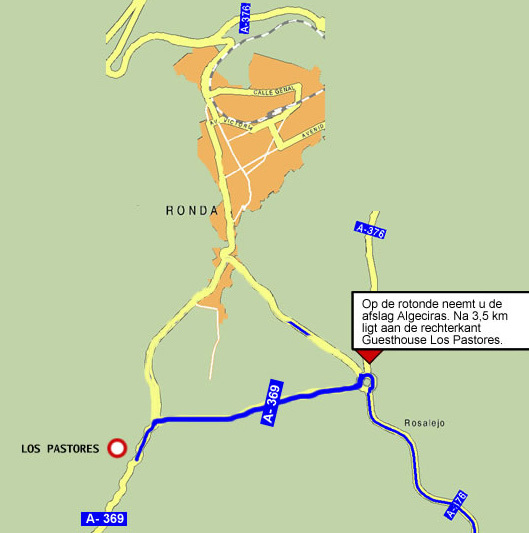 Right before entering the city ofRonda, turn left on the A- 369 to Algeciras. 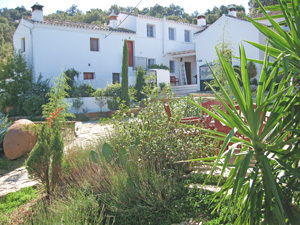 After about 3,5 kilometres, rightafter passing the campingsite El Sur, on your right you will find GuesthouseLos Pastores. If you would like us to arrange a car hire or taxi from the airport then add this request to your booking request and we will happily send you a quote. As the hotel is set in such peaceful, tranquil surroundings what better way to explore than on horseback. Treks and hacks can be arranged when you arrive. The hotel grounds cover a very large area and we even have our own mountain! There is plenty of wild life to be seen around, from the birds of prey to deer and Ibex. If you decide to go exploring, you can take some of the tracks that lead up to the caves and hidden lakes. Of course, if you are feeling less energetic, there is the infinity swimming pool to laze around. We have a good choice of rooms and apartments for you to stay in at the hotel. Click on any of the images below to see more information about the rooms and apartments that we have available. You can book a room by filling in the form shown. The hotel is set in very peaceful, tranquil idyllic surroundings. 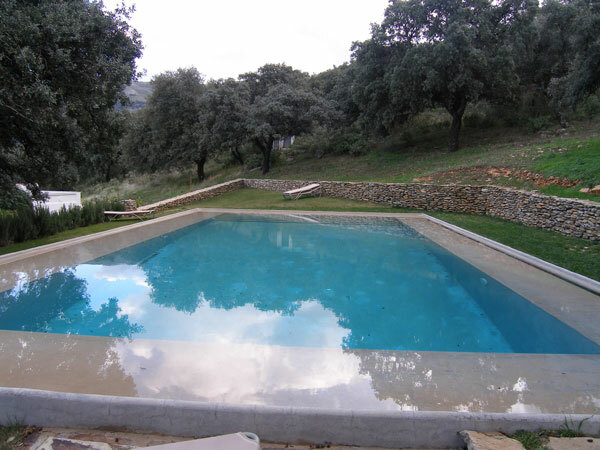 There is a beautiful infinity swimming pool and many country walks that can be taken there deer may be spotted. The farmhouse was built on top of a small mountain, which provides an excellent view over the mountainous countryside. Here one can imagine being perfectly alone. 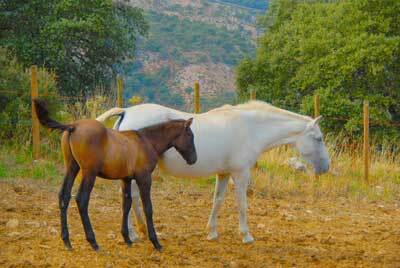 Ronda is situated about 50 kilometres from San Pedro de Alcantara, a 45 minute; drive by car. The road meanders first through the mountains of the Sierra Bermeja, then through the Serrania de Ronda before leading up to the town itself. Enjoying a rich history, Ronda is among Andalusia’s most resplendent cities. It was built on top of a high outcropping in the mountains of the province of Malaga. It is famous throughout Spain for its gorge, which separates the newer parts of the city from its ancient eighteenth century centre. 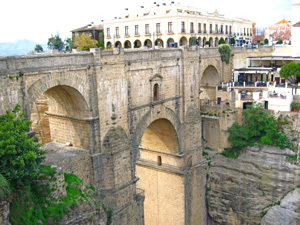 This gorge is known as El Tajo and is spanned by a beautiful bridge which connects the ancient centre and the newer parts of the city. Standing on the bridge, one can enjoy a magnificent view of the river Guadalevin. Ronda is also famous for its arena, where bullfights are staged. The Plaza de Toros is the oldest and most beautiful arena of all Spain. When no fights are staged, the arena is open to visitors. It has a fascinating museum brimming with information and memorabilia of Spain’s most famous bullfighters. 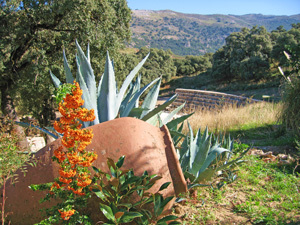 The mountainous area south of Ronda is called the Serrania de Ronda. The vast natural landscape has some occasional small villages and isolated farms, but is otherwise largely uncultivated. Its highest mountaintop rises a spectacular 1900 meters. A beautiful valley cuts through the heart of the Serrania. Through this valley runs the Rio Genal, a river that springs just outside of Ronda and finally has its outlet in the sea. Geographically, the Serrania de Ronda is a very special area. The higher parts of the area exist of bare limestone rock faces, while its valleys are relatively green and fertile; a stunning combination of rugged mountainsides and fertile valleys. Thus the Serrania constitutes the perfect country for hikers and bicycle-enthusiasts who like this kind of variety. The Serrania de Ronda has an abundance of large birds of prey such as vultures and eagles. Floral life is especially exuberant in spring. Apart from olive-trees and chestnut-trees, the lower laying parts of the land have many cork oaks. These have a rich brown-red colour right after the cork is harvested, which happens once every nine years. 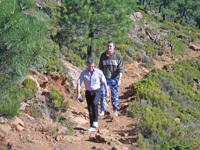 The Rio Genal’s area offers the perfect starting point for trips to two other nature- reserves in the vicinity, the Sierra de Grazalema and the Sierra de las Nieves. There is, however, a lot more to this region of Spain than just its spectacular landscape. Culturally, Ronda and its neighbouring villages have a lot to offer. Moreover, the area is located centrally between such famous cities as Grenada and Sevilla. Should a day at the beach have your fancy, the sea can be reached - by car in less than an hour.